The hot topic in WiFi nowadays is high density (HD), and for good reason. It seems you can't swing a dead cat anymore without hitting some place (concert hall, convention center, tourist trap) where there's an attempt to offload cell phone data onto a WiFi network. The most interesting thing about HD WiFi to yours truly is that it's the same fundamentals we've always known about, just recycled. If you were one of the lucky (unlucky?) ones to work in WiFi during its more formative years, you may have been taught certain basic concepts about WiFi. For the author, fond memories still remain of sitting an Enterprise WLAN Administration course way back in 2003 (taught by noted Massachusetts Yankees fan David Westcott) as part of my preparation for the certified wireless network administrator (CWNA) exam. What did Mr. Westcott teach us lo these many years ago? Plan out your space alternating between channels 1, 6 and 11 in the 2.4 GHz band. 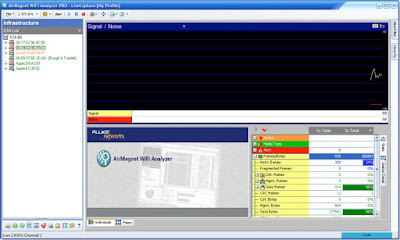 WildPackets OmniPeek has long been my favorite WiFi sniffing software, but lately this blog has been short on posts about it. That needs to change. So today I start a multi-part series (number of parts to be determined) on how I use OmniPeek to help me plan for and troubleshoot mobile devices. Mobility (defined here as seamless roaming between WiFi access points [APs]) is a longstanding enterprise WLAN issue that has kind of taken a back seat to supporting personal devices (a.k.a. BYOD). For many enterprises, mobility remains important. 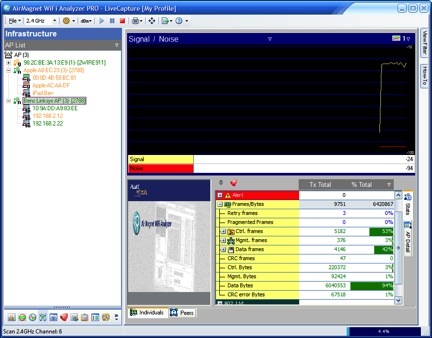 Car dealerships with push-to-talk handsets, warehouses with barcode/RFID scanners and retail locations with point-of-sale terminals are all examples of locations that require user devices to move around a large area without dropping connections, losing speed or experiencing choppy service. Oh, those darned iPhones. Can't live with 'em, can't keep your job without 'em. The vagaries of iPhones and other station devices are the most difficult part of managing a WiFi network, but there are some things that can be done on the infrastructure to try to make your stations work better. One of those things is lowering your AP transmit power to a level that more closely matches your client station's transmit power. You say you like WiFi Sniffing? And having fun? And not succumbing to a painful demise due to liver sclerosis? 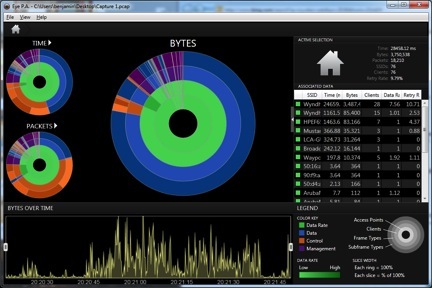 Well, then there's only one product pronounced eye-pee-ay for you: Metageek's new visual protocol analyzer, Eye P.A. Amid all of our divisions over race, gender, religion and whether the Champions Bowl is going to be better than the Rose Bowl, we can agree one one thing: products named after alcohol are great. 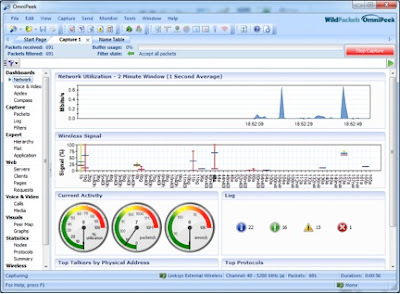 So you can imagine my excitement when I was made aware that Metageek -- hero to Windows users, villain to Mac users and tease to iPad users -- had introduced a WiFi sniffer. We all know that the iPad is great. We watch video on it, we play games on it and we can view our Twitter feeds on it (which, really, is where we get allimportantnews). The only problem is, I could never do any work on it. The fact that Apple doesn't allow the internal WiFi radio to be used as for protocol analyzer software, site survey software or spectrum analyzer software always bugged me. 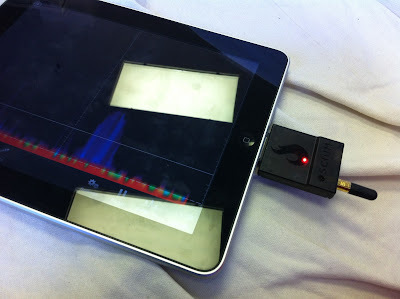 Now, thanks to Oscium's WiPry-Spectrum, a spectrum analyzer is available, and boy does it show why the iPad is the ideal form factor for WiFi field work. Mice in beer bottles, cold hands and supporting VoIP applications. These are a few of a wireless admin's least favorite things. And while this blog is the wrong place to look for solutions to two of those problems, here are some things to look for when evaluating software that lets you talk. Voice over WiFi is a topic that yours truly has written about before, but never in any real detail on this blog. Part of the reason is that the previously linked whitepaper was something less than a performance for the ages, and part of the reason is that VoFi is still a ways away from being a pervasive technology. 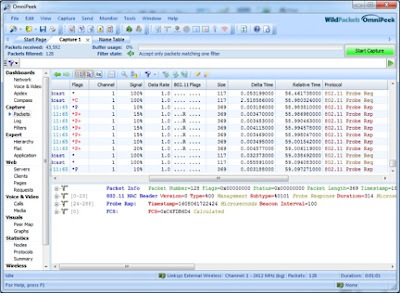 Over the last few weeks the need to use VoFi software has arisen, and now is as good a time as any to describe how WiFi analysis software can be used to sniff out (pun not intended. Seriously. That word that is also in the name of this blog WAS TOTALLY ACCIDENTAL AND WITHOUT ANY INTENT AT SELF-PROMOTION AT ALL.) 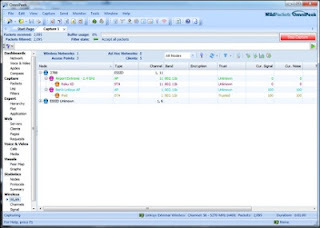 which VoIP application is best. How Do I Know (If It Really Links Me)? Last week I put out a call for blog topic suggestions and my man Keith Parsons made the fine suggestion of going through some tips for troubleshooting using Mac OS X. I think that is a good idea, so here is a little bit on troubleshooting connection problems on my (and the unemployed screenwriter industry's) favorite operating system. 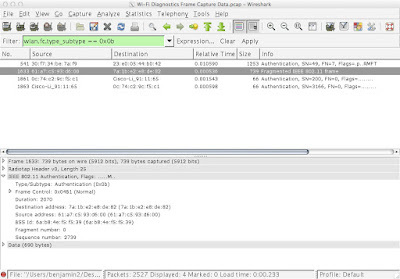 If you understand 802.11 protocols, then troubleshooting connection problems can be done at an extremely low level. When your (or the people you support's) WiFi connection seems to be unavailable for no reason, you can look at the frames being sent to see if things are going the way they're supposed to.